Tension has been building up for years in Indian administered Kashmir, but the recent killing of 40 Indian paramilitary police by Kashmiri separatists has precipitated a direct conflict between both nations. 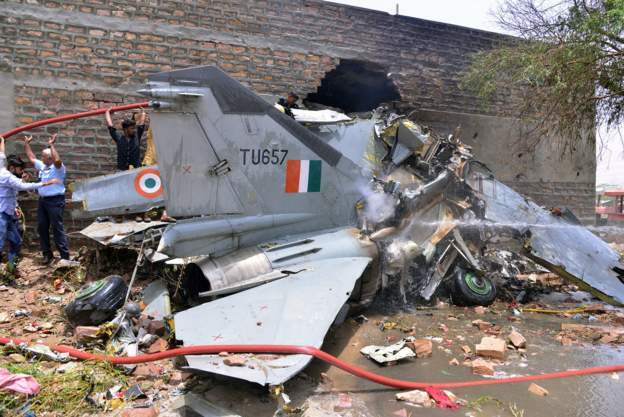 An attack by the Indian Air force on a claimed operational base for the insurgents inside Pakistan, has now had a retaliation by the Pakistan air force, in which two Indian aircraft have been downed and at least one crewman held captive. 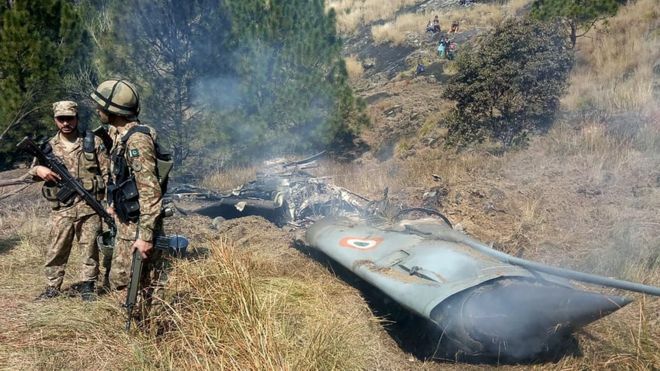 Details of this last encounter remain sketchy, but it seems that Pakistan may have tried to hit a target but been intercepted by the Indian air force who took the fight across the border back into Pakistan. Is a wider conflict between these two countries inevitable or will both back step back from the brink, before it becomes a full on armed conflict? India said it lost one MiG21 fighter and a pilot was missing in action. Pakistani PM Imran Khan said the two sides could not afford a miscalculation with the weapons they had. India and Pakistan - both nuclear-armed states - claim all of Kashmir, but control only parts of it. They have fought three wars since independence from Britain and partition in 1947. All but one were over Kashmir. The aerial attacks across the Line of Control (LoC) dividing Indian and Pakistani territory are the first since a war in 1971. They follow a militant attack in Kashmir which killed 40 Indian troops - the deadliest to take place during a three-decade insurgency against Indian rule in Kashmir. A Pakistan-based group said it carried out the attack. Last edited by caratacus; February 27, 2019 at 09:13 AM. These air strikes are wrong. India and Pakistan have acted in a reckless and provocative manner. After today's actions I urge both sides to put aside the rhetoric, get round the negotiating table and stop this kind of thing happening again. It would help if Pakistan didn't send terrorists into India, who proceed to murder random Indians and foreign tourists alike. International pressure is being placed on both countries to descalate the tension, from the US, China, Russia etc However, there is still widespread anger in India. especially over the killing of tHose 40 servicemen, and with two shot down Indian aircraft and images of a blindfolded Indian pilot being held captive, the pressure upon the Indian government to undertake further military action must be very great. You wouldn't expect Prime Minister Narendra Modi to be too resistant to that pressure, whatever the consequences. The decision to undertake an airstrike into Pakistan was incredibly risky, and so far it is India that has come off the worst for it. I think the Indians have been influenced by the actions in the middle east, using air power for counter-insurgency. Problem is those ops where conducted against insurgents operating without air defence. Pakistan has equality to Indian so could protect their airspace. The video of the Pakistani civilians beating the captured Indian pilot while the Pakistani soldiers don’t intervene is only going to harden the resolve of the Indian public. Dumb move especially during an election year. There has been an increasingly level of radicalism in Kashmir which is creating a toxic situation that was bound to escalate into violence, Street clashes are now common and with that a increasing build up of Indian security forces. A situation the world has largely chosen to ignore. This is a good video showing the situation in Kashmir in which religious faith has become the foremost point of division, rather than self determination and national identity. Crickets from the Indian MoD. They are probably reviewing their options. India is stronger than Pakistan. They can choose to escalate. 1. A war will probably boost Modi’s position since he draws on Indian nationalism. 2. They may create an opportunity to take all of Kashmir. I don't think outside players would let that happen. You cant control a country like India. Especially over a sensitive issue like this. As Trump is busy with Kim in North Vietnam and busy with backing up Gaido in Venezuela and at most he is TRUMP. UN Security Council should pass a resolution. Their air force is a laughing stock though which is all that really matters in this day and age. Terrorising one's own people does not an effective military make, and one wonders how well they maintain their weapons. If I had to choose between betraying my friends and betraying my country, I hope I would have the guts to betray my country. Pakistan does not have a better army than India. This is why tactical nuclear weapons are part of Pakistan military strategy to stop any Indian invasion into Pakistan. This is nothing but an old problem that has now boiled over. Sure Pakistan and India have had poor relations and tensions and clashes before because of the disputed territory of Kashmir. That isn't really the problem here is much as it is Pakistan continuing to support Islamic militant groups against India. Pakistan does this to its other neighbors as well like Afghanistan and Iran. India came close to attacking Pakistan before over similar attacks like the terror attack against India's parliament years ago. Now the tensions are even worse and nationalism is burning like a fire in India right now to really respond against Pakistani attacks. If Pakistan continues its behavior this really might get out of control.